Southwest Captain Tammie Jo Shults, other members of the crew of Flight 1380 and several passengers who were on the aircraft met with Donald Trump. Washington: US President Donald Trump welcomed to the White House on Tuesday the pilot of a Southwest Airlines jet which lost an engine in flight and praised the "incredible job" she did in landing the stricken plane. 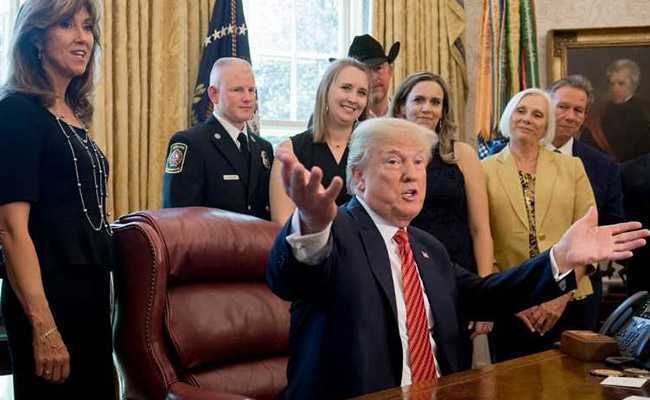 Southwest Captain Tammie Jo Shults, other members of the crew of Flight 1380 and several passengers who were on the aircraft met with Trump in the Oval Office. Shults, one of the first women fighter pilots in the US Navy, has been hailed as a hero for calmly landing the Boeing 737-700 on April 17 after a midair engine explosion. Flight 1380 was en route from New York to Dallas when its left engine suddenly blew apart, sending shrapnel through a window and killing a 43-year-old New Mexico woman. Shults managed to safely land the plane, which had 149 people on board, in Philadelphia. "I'm honored to have the heroic crew and passengers of Southwest Flight 1380 at the White House today," Trump said. "Tammie did an incredible job," he said. "I especially want to commend you for your life-saving actions. "Everyone's talking about it," Trump said. "You drew from years of training and safety and you knew how to land that plane. "We salute you and every member of this crew." The Federal Aviation Administration has ordered emergency inspections of jet engines like the one that ruptured during the Southwest Airlines flight. Shults' expert handling of the emergency has drawn comparisons to the legendary "Miracle on the Hudson" pilot Chesley Sullenberger, who landed a disabled US Airways airline in the Hudson River in January 2009 after a bird strike.